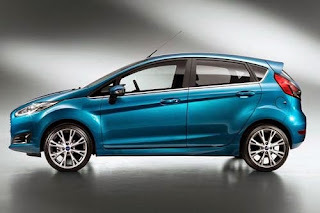 OTONEWS - American automakers, Ford has made some refreshment on the hatchback, Fiesta. Fiesta now comes with a more beautiful and more efficient engines Fuel (BBM). For the ECOnetic variant of the 1.5-liter diesel engine capable of producing the fuel consumption of 3.2 liters / 100 km (73.5 mpg) with 82 g CO2 / km. This result is an increase of 16 grams / km from 2008 model year. For Fiesta Red and Black version with 1.0-liter EcoBoost engine capable of producing 125 PS (92 kW) and 1.5 liter TDCi capable of producing 95 PS (70kW). As for the Titanium and Sport models get a change in the exterior like chrome grill and made lower and using 16-inch rims. Not only that, the headlights were also equipped with integrated LEDs. Color choices are also more varied, including Magnetic, Candy Red and Silver Silk. For the Sport models available colors Frozen White, Panther Black, Race Red and Candy Blue. The interior is getting a new seat and steering wheel and handbrake are already coated with leather. No Comment "Ford Make Fiesta More Beautiful and Save Fuel"